Houston has some impressive freeways around its downtown that provide great views of the skyline. A massive new interchange at the intersection of US59 and I-10 is under construction to complete the downtown Houston freeway system. I-45 just north of downtown, looking south. The approach to downtown provides an awesome view. 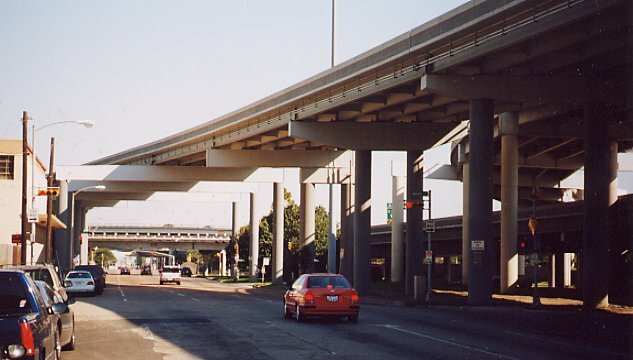 The I-45 Pierce elevated (named after Pierce street which is adjacent to the freeway) was opened in 1967 and was fully reconstructed in 1997. The Pierce elevated crosses over Pierce street at the southeast end of the Pierce elevated. South of downtown, I-45 is a dual freeway with eight main lanes, one HOV lane, and six elevated lanes on two structures between the main lanes and feeders. The elevated structures are actually part of the future 35 freeway. 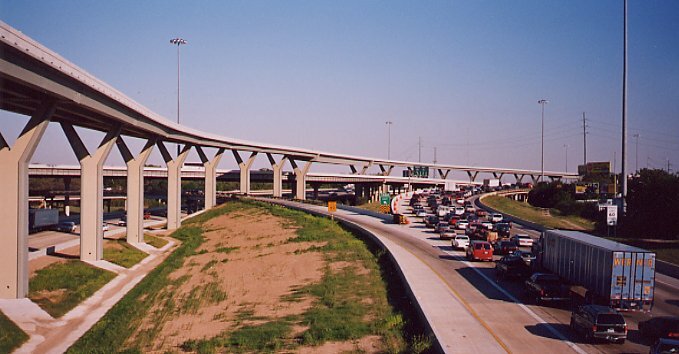 This section of I-45 was one of Houston's first freeways, constructed around 1950. It was fully reconstructed and expanded to the current configuration in the early 1980's. I-10 as it merges with I-45. 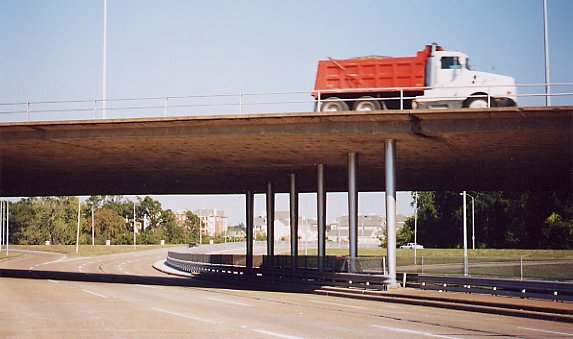 The elevated HOV ramp was completed in Q4 of 2000. This view looks east. West of downtown, Memorial drive is an access controlled mini-freeway. 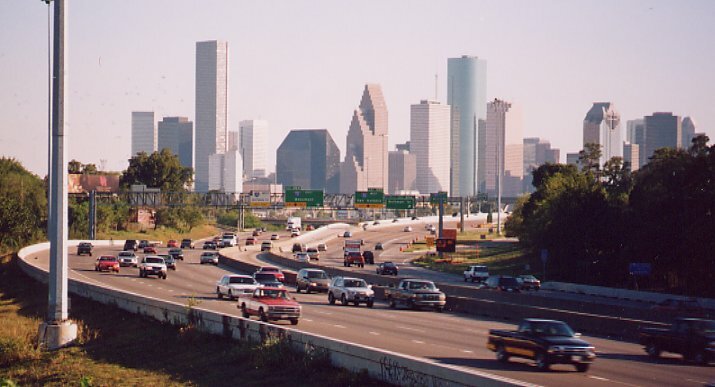 Eastbound motorists see classic views of the Houston skyline. The view looks east. Check out the steel pole supports for this 1950's era bridge over Memorial Drive. Steel piers are highly unusual in Texas. The South Freeway (Texas 288) south of downtown is on a wide right-of-way with a wide pasture for a median. The full length from downtown to I-610 south is depressed below grade. The wide open spaces of the freeway and great views of downtown make the South freeway one of the USA's nicest urban freeways. The South freeway was opened in 1984. This view looks north. Looking north where US59 (Southwest Freeway) and TX288 (South Freeway) merge together south of downtown to form a very wide freeway. The section of freeway was opened around 1975. The large white structure in the left background is the new Enron Field baseball stadium with retractable roof, opened in spring 2000. Looking north at the intersection of US59 and I-45. Looking north along the southbound lanes of US59 at the US59/I-45 interchange. This interchange was built around 1970. A massive interchange and distribution system into downtown is under construction at the intersection if US59 and I-10. 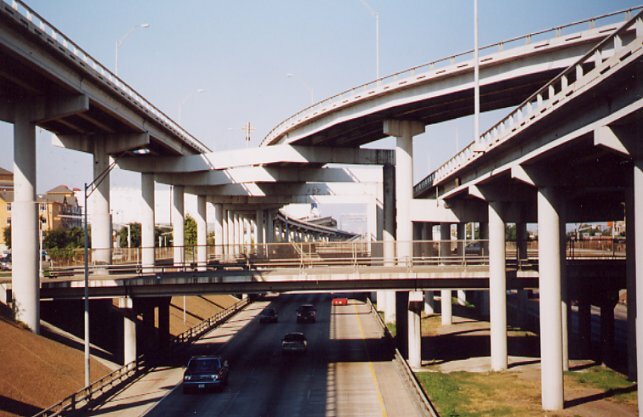 This interchange will complete the downtown Houston freeway system. 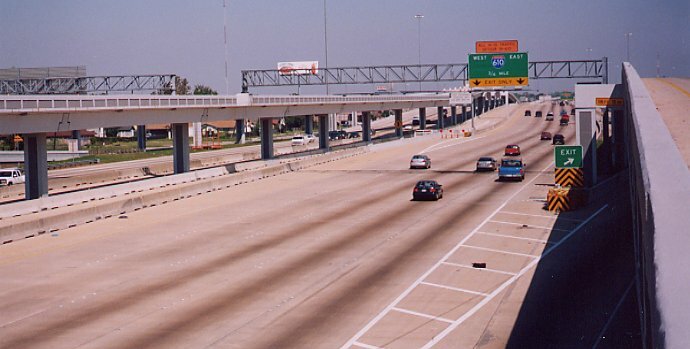 Future enhancements will be minor, possibly including the Hardy Toll Road downtown extension. 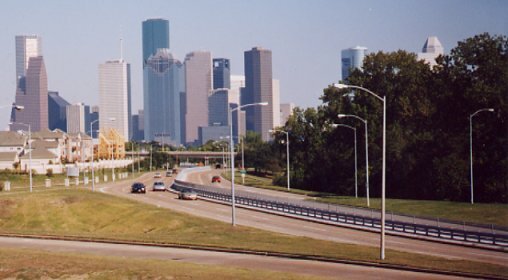 A massive expansion of US59 north of downtown was completed in 1998. This view looks north along the northbound lanes with the elevated HOV in the freeway center.